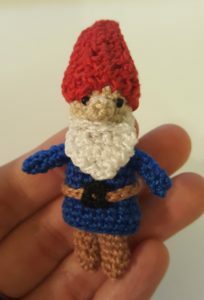 Another form of self-care: crocheting random stuff, which I then list on Etsy because who needs a handful of tiny gnomes? Every year I set goals for myself. Let me preface this by saying 2017 sucked. I took on too much academically, especially in light of getting a part-time job that was more stressful than I’d anticipated (emergency shelter residential youth services direct care counselor), and having to revise my comprehensive exam twice set me back too. Throw in a health scare (I’m okay though!) and some personal issues that’ll make for a great book, tentatively called Every Day Is the Worst Day of My Life, and maybe I should be proud about how much I actually did manage to accomplish, rather than frustrated about how many goals I didn’t reach. Either way, here’s how I did over the past year. 1. Finish something every month – short story, novella, novel, anything. I finished a handful of new stuff, but nowhere near something every month. 2. Publish at least 4 things – again, short story, novella, novel, anything. I DID THIS!!!!!! I published THIRTEEN stories on Medium, nine of which were previously unpublished works. 3. Finish the draft of a nonfiction book that’s good for my career. I outlined the book and started the draft, but that’s as far as I’ve gotten. I had to revise my comprehensive exam twice, which set me back and took away from this project, as has working on my dissertation. 4. Do more live events – readings, book fairs, etc. I did several events this year: a local lit fest, a book fair, and a solo reading. I sold an average of one book per event and didn’t give away enough swag to even say I got my name out there. My time is pretty damn valuable right now, so I’m going to hold off on local stuff for awhile because it’s just not worth it. 5. Travel more internationally – and Canada doesn’t count. Other than a couple weeks in India last January, I unfortunately only made it out of the country to Canada – and even then, it was only once (okay, maybe twice because we drove from Seattle to Banff to Glacier National Park back up to Alberta and over to Winnipeg, but it was all the same trip). I got a part-time job starting in the summer, so now I have the money to travel but not the time. I did manage to get several trips in though: Georgia and the Carolinas over spring break, a week solo in a secluded cabin in northern Michigan, that trip to the Pacific Northwest and the Rockies, plus some day trips and weekend trips around the Midwest. And on a happier note, I leave for India again in about a week (spending two weeks there with my kid), then it’s on to Iceland for spring break and a month in Thailand in June, which hopefully will also include some time in Singapore and Bali. And a summer trip to the southwest, that may include a jaunt down to Mexico. I started out doing pretty well at staying on pace, but really fell off this fall due to a grueling schedule that left little time for reading. I read a bunch of stories on Medium, but those aren’t trackable or books. I ended up reading 56 books total in 2017. As Armando Christian Pérez says, “Reach for the stars, and if you don’t grab them at least you’ll fall on top of the world.” Every year I set myself some Big Hairy Audacious Goals (BHAGs), knowing full well that I probably won’t reach them but at least they’ll move me closer to my overarching, long-term goals of becoming a more successful author, expanding my horizons, and achieving within my career field. This year, despite not really doing everything I’d planned, I’m still further along the path than I was a year ago. And next year’s BHAGs will get me further along as well. Better time management. I’m generally pretty busy with work and school and life, so when I get a moment to breathe I spend it on something like cat videos. While self-care is important, I have a long list of goals with many parts, and I need to focus if I’m going to accomplish everything on my lists. To that end, I’ve made a checklist of 13 things I want to get done every day, including writing tasks, school and career projects, and self-enrichment activities. I plan to track what I do every day, at least until it becomes an ingrained habit. Publish to Medium at least weekly. Publish a stand-alone novella or short story collection quarterly. Grow my reader base, whether on social media, my newsletter, or Medium, by at least double. So, 600 followers on Facebook, 1500 followers on Twitter, 200 followers on Medium, and 3000 mailing list subscribers. Post to my blog at least twice a week, and promote those posts to get more traffic here. Can I do it? Probably not. But I can at least try! If you’ve set goals for yourself, what are they? How do you plan to accomplish them?